Boston is renowned for its a wealth of amazing historic, cultural and culinary experiences, and is also known as the ideal gateway to New England. For those basing themselves in Boston, there many great day trip experiences easily accessible from the city, some of which we have outlined below. With its distinctive history and strong maritime heritage, Salem is a super day trip from the hustle and bustle of Boston. And it couldn’t be easier to reach, with options by car, rail or ferry, all in under an hour’s journey. Once there, highlights not to miss are the Salem Witch Museum, strolling along Pickering wharf with its array of eclectic shops and dining at one of its amazing bistros. No trip to Salem is complete without a visit to the evocative House of the Seven Gables, which provided inspiration for much of Nathaniel Hawthorne’s seminal work incorporating New England themes. 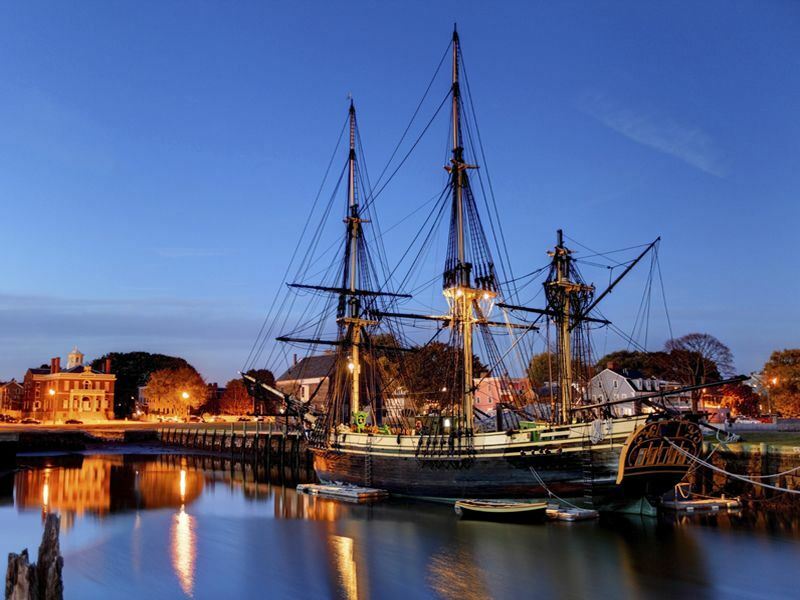 Other great experiences include the Salem Maritime National Historic Site and the world class Peabody Essex Museum. Salem is of course most famous for its witch trials in the late 18th century, and you will find reminders of this heritage throughout the city. The nearby town of Danvers which was part of Salem at the time of the trial also offers unique attractions and showcases fascinating artifacts from this period. 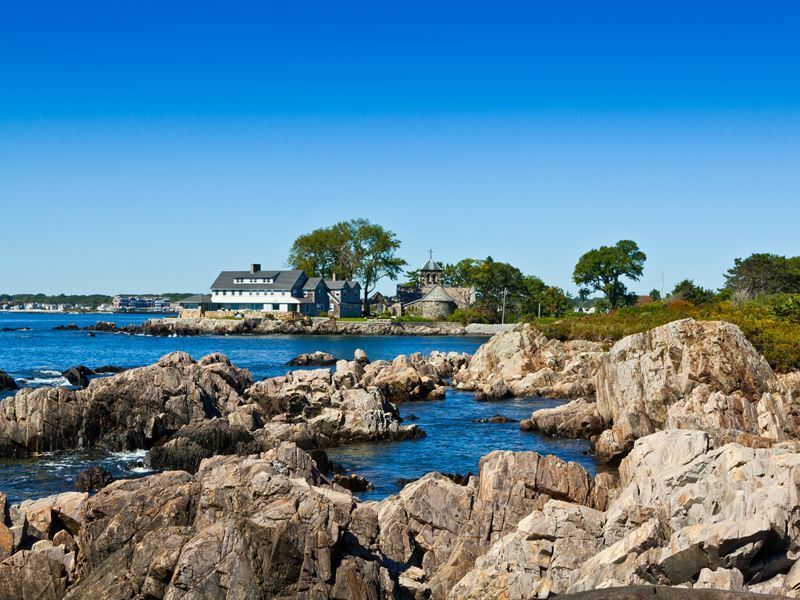 Made famous by the award-winning film of the same name, Manchester-by-the-sea offers visitors a vibrant downtown area, beautiful parks and walking trails. Enjoy classic coastal fare such as New England lobster roll or clam chowder or stroll the famous ‘singing beach’, named for the sound made when people walk across it. This evocative seaside town is easily accessible by car or train in under an hour from central Boston. A little over an hour’s drive from Central Boston, sitting on the Piscataqua River is the vibrant New England city of Portsmouth. Tracing its roots back to the early 1600’s, Portsmouth’s picture postcard waterfront area boasts an array of pastel coloured buildings, whilst red bricks make up the cobbled streets and Victorian architecture of the city’s downtown area. The best way to explore the city is to ditch the car and explore on foot, strolling the charming Market Street area, which offers an amazing array of ale houses, bistros, art galleries and boutiques. 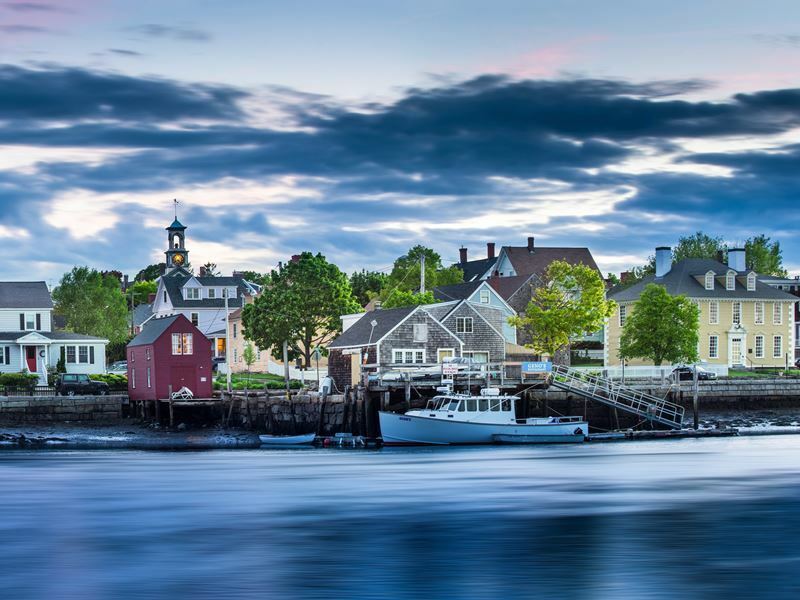 As charming coastal towns go, they don’t come more charming that Kennebunkport, Maine. A straight drive out from Boston will take just over an hour and a half and into this picture postcard town, set a mile or so inland along the Kennebunk River. Both white and pastel coloured clapboard style buildings punctuate the picturesque streets which are lined with an array of gift shops, antique stores and craft outlets. Taking a bike ride is a favourite way to explore the town and you can easily reach the white sands of nearby Kennebunk Beach in less than fifteen minutes. Be sure to visit the Seashore Trolley Museum with its huge display of antique streetcars as well as the First Families Museum that highlights both the town’s sea captain heritage and the history of President Bush’s summer residence. Right in the heart of the town and on the river you will be able to savour seafood favorites such as lobster and clam chowder at the varied assortment of sea-to-table restaurants. For those who decide to stay a while, lodgings comprise various attractive locally styled inns and B&B accommodations. The buzzing port city of Portland is well worth the drive up from Boston. 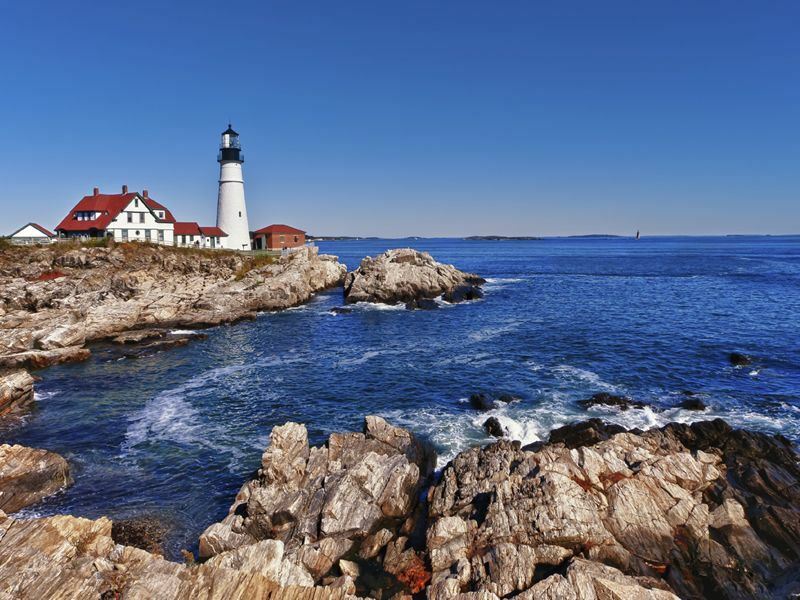 In less than two hours you’ll arrive into Maine’s most populous city, with its strong maritime heritage and buzzing arts and music scene. The beating heart of the arts district lies on Congress street, while the Old Port district entices with and array of Oyster bars, brew pubs and eclectic music venues. Seafood is one of Portland’s main draws and you’ll not be disappointed with the amazing lobster dishes and clam chowder on offer in one of the many restaurants that line the wharfs and piers along the city’s waterfront. Lexington, MA lies just a half an hour’s drive from downtown Boston and transports you back in time as you discover the town’s unique colonial and revolutionary war past. History is revered here and Lexington takes an active pride in preserving the charm of its New England past. Head for Battle Green, where the past is brought into focus as this National Historic Landmark showcases the revolutionary history of the area. It is one of the only places in the United States where the US flag is authorized by Congress to fly 24 hours a day. Highlights include; The Minuteman Statue - a life-size bronze figure of a colonial farmer with musket, The Revolutionary War Monument, a granite obelisk marker and relief map of the Battle of Lexington. Discover more fascinating local heritage as you explore Concord’s strong colonial and revolutionary history. Dating back to as early as 1635, Concord is located an easy 30 minute drive from the centre of Boston. There is also the option to ditch the car and ride a train in just under 40 minutes. 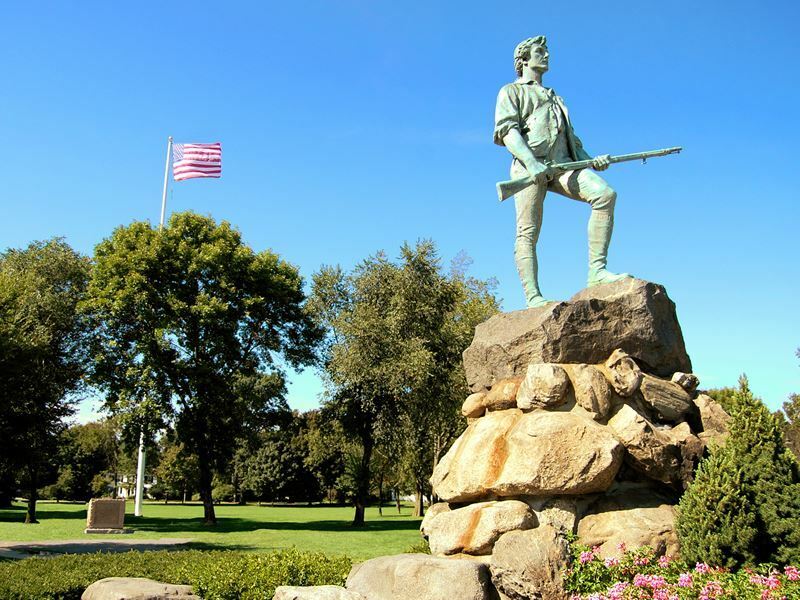 Concord fully embraces and articulates its revolutionary past through its array of sites and monuments that chronicle and showcase this important part of America’s early history. Key attractions include; The Minuteman National Historic Park, The Concord Museum, Old North Bridge and Sleepy Hollow Cemetery. For an authentic insight into life in early 19th Century New England head out to Old Sturbridge Village, the largest outdoor history museum in the Northeast, located around an hour’s drive from downtown Boston. The museum, which is set on over 200 acres of scenic countryside, authentically depicts a rural New England town of the 1830s. Explore the more than 40 fascinating original buildings, along with homes, meetinghouses and a district school. Other highlights include a country store, working farm, and trade shops. Historians dressed in authentic period costumes will help narrate your visit. This is a must-see attraction on any trip to the Boston area. Heading south, an hour and a half’s drive from Boston you’ll reach the stunning maritime playground city of Newport, Rhode Island. This attractive coastal community is characterized by its picturesque harbour, array of pretty white yachts, iconic lighthouse and beautifully set waterfront restaurants. Newport is also renowned for its amazing architecture - mansions set high on cliff tops with amazing views out over the ocean. The perfect way to experience the best that Newport offers is by taking a trolley tour which can include entrance to many of the key attractions. For the slightly more energetic visitor cycling is another great option for exploring the key sites of Newport. Highlights include; The Breakers on Ochre Point Avenue, set in the renowned Bellevue Avenue Historic District – a stunning former Vanderbilt mansion that is now a National Historic Landmark and is also the most visited attraction in Rhode Island; Castle Hill Light House – this iconic landmark is not open to the public but can be viewed from the adjacent grounds of the Castle Hill Inn & Resort and make for a great photo opportunity; Brenton Point State Park – Set amid the former grounds of one of Newport's grandest estates, Brenton Point State Park affords its visitors one of the most commanding and spectacular views on the East Coast; Newport Cliff Walk – for a more adventurous activity, parallel to Newport’s eastern shore is the Newport Cliff Walk with a 3.5 mile trail that offers spectacular ocean views adjacent to some of the city’s finest mansions and homes. 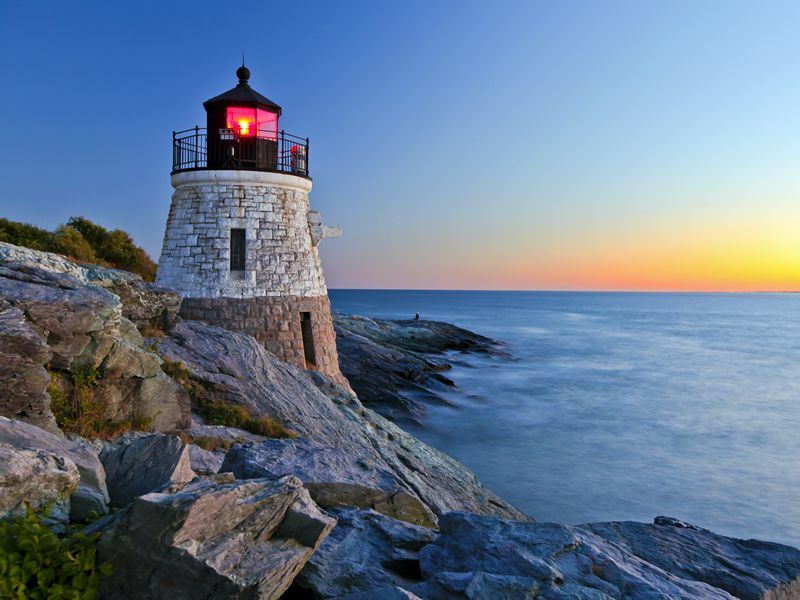 Just over a 45 minute drive from Boston lies the iconic coastal town of Plymouth, MA – also known as ‘America’s Hometown’. Founded in 1620 by the Mayflower Pilgrims Plymouth is where New England was first established and is renowned as for hosting the very first Thanks Giving Feast. Plymouth’s history might be its draw but the town has a quintessential New England look and feel, with whitewashed clapboard buildings, a charming downtown and expansive ocean views. Things to see and do include; Pymouth Rock – located in Pilgrim Memorial State Park, a simply inscribed grantite boulder marks the spot where the first settlers arrived on the Mayflower; Plimouth Plantation (New England Living History Museum) – a 17th century English Village, also housing a replica of the Mayflower and Plimouth Grist Mill. 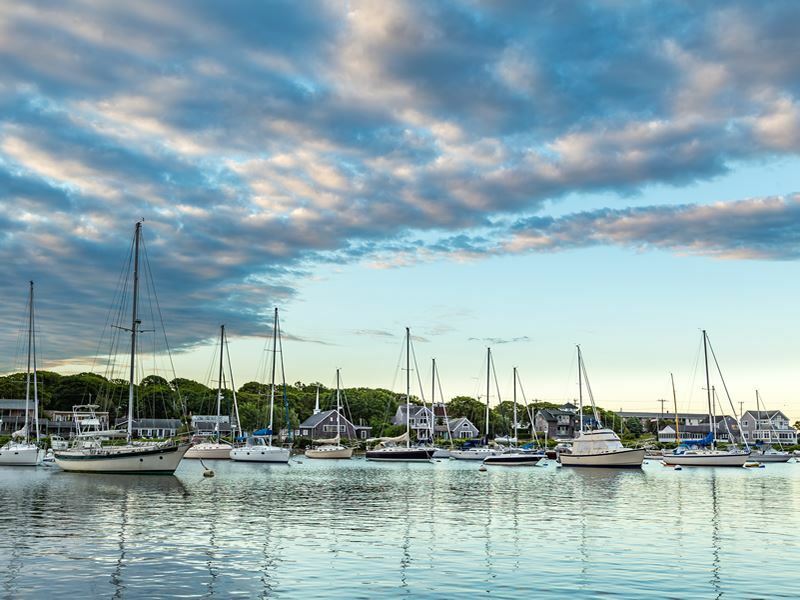 Well worth a day trip from Boston and set on the extreme south west corner of Cape Cod is the charming town of Falmouth, MA, also home to the beautiful seaside village of Woods Hole. 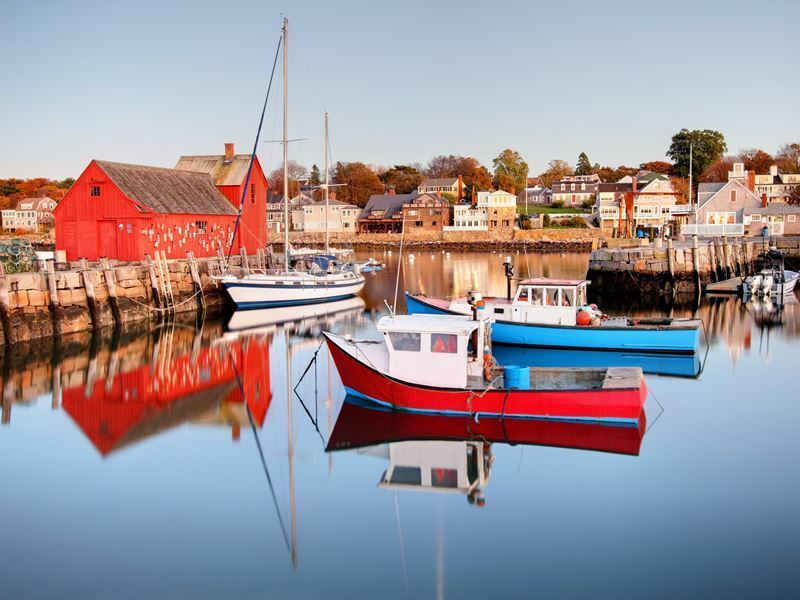 In just an hour and a half’s drive from downtown Boston you are brought into this charming community with its strong history and maritime heritage. 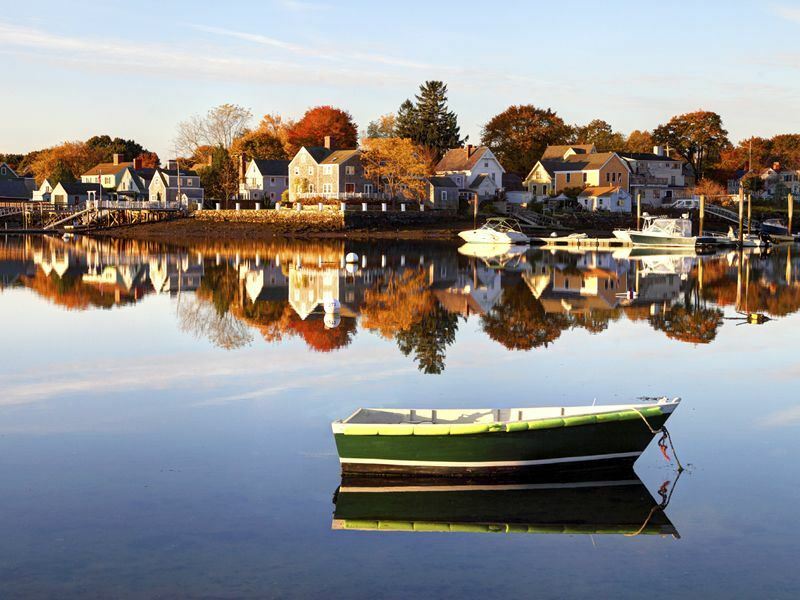 The Falmouth area encompasses 8 quaint villages and over 68 miles of aquamarine shoreline. Tree lined Main Street Falmouth boasts an array of classic New England stores, antique shops and dining establishments and is anchored by the beautiful triangular Village Green, fringed with an array of majestic late colonial homes and building. Falmouth offers a vibrant and diverse culinary scene, serving up local favourites such as lobster and clam chowder. Woods Hole offers the perfect blend of science, stunning seascapes and a charming harbour and waterfront district. Home to the Woods Hole Oceanographic Institute - set in a former church – this facility is packed with fascinating interactive marine displays. At the Woods Hole Science Aquarium, marine veterinarians care for and rehabilitate injured sea-life and study marine ecosystems. Be sure to pay a visit to Nobska Lighthouse, built in 1878 and Woods Hole’s most iconic landmark. For the energetic, rent a bike and cycle part of the Shining Sea Bike Path which runs 11 miles from the Woods Hole harbour l the way to North Falmouth, the original route of the now disused railroad. For much of its route this scenic ride hugs the coast and provides amazing views of the beaches, ocean as well as glimpses of local wildlife. Just a short 45 minute ferry ride from Woods Hole is the charming port town of Oak Bluff on the vacation hotpot island of Martha’s Vineyard. From the moment the boat docks you start to see the attraction of this colourful and historic town with its pristine sandy beaches, eclectic downtown shops and historic architecture. Head for the bustling one-way Circuit Avenue, where you’ll find an array of restaurants, bars, ice-cream and coffee shops as well as an assortment of unique boutiques and souvenir shops. Set in the Oak Bluffs ‘Campground’ you discover the town’s renowned ‘Gingerbread Cottages’ - a series of 19th Century homes, with their quaintly delicate trim, picket fences and diminutive size that gives rise to their distinctive name. As with most New England coastal communities Oak Bluffs has its own lighthouse – the iconic and photogenic East Chop Lighthouse, accessible via the scenic coastal road which is well worth following to get a real feel for this seaside community. Whilst touring the area there are several beaches that make a great stop for a stroll and take in the salty air. Inkwell Beach is close to dock and Joseph Sylvia State Beach is popular for those that love long beach walks. Weary from your exertions? Look no further than Mocha Mott’s – a laid back and super popular café right on Circuit Avenue. During the summer months an absolute must do is a Cape Cod whales watching cruise operating out of Barnstaple Harbor, an hour and half’s drive from downtown Boston. Tours run from April through to October with the best whales watching to be had during the June to September period. The waters around Cape Cod consistently rank as one of the world’s top 10 whale watching destinations and the tours operating out of Barnstaple have a thirty year sighting rate of 99%. The Cape Cod oceans are seasonal home to humpbacks, finbacks and mink whales as well as occasionally to vast numbers of Atlantic white-sided dolphins. Your cruise, onboard a state of the art jet-powered vessel, will also showcase an array of seals, seabirds and other maritime wildlife to help top off a truly memorable experience. Following your half day cruise enjoy some delicious local fare at the one of the rustic seafood restaurants just footsteps from the boat dock. Set on the most northerly tip of Cape Cod and reached in just under two and a half hours from central Boston, Provincetown, MA is an eclectic mix of fascinating history and contemporary open-mindedness. The town boasts a series of beautiful beaches, amazing restaurants, attractive art galleries and an assortment of charming shops, many to be found on the busy and bustling Commercial Street. With a rich creative history and heritage the town is home to the oldest art colony in the US. Artists, sailors, fishermen and authors make up a diverse population and Provincetown is also known as a top LGBTQ destination. This eclectic seaside town is also famously known as the site of the Mayflower’s original landing in 1620. Be sure to visit the towering Pilgrim Monument which offers amazing sweeping views across the town and out to sea. The monument, along with the neighbouring Provincetown museum, helps commemorate this significant event in America’s early history. 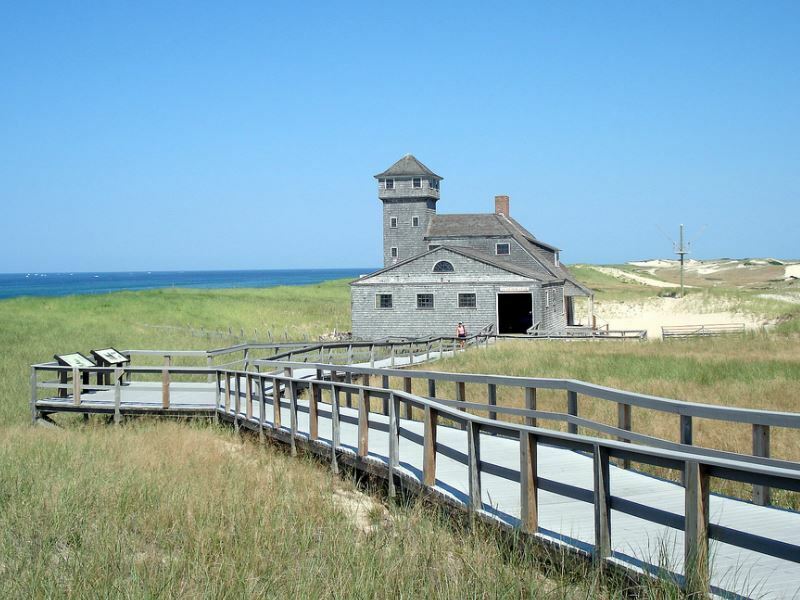 Race Point Lighthouse offers picture postcard photo opportunities with its distinctive New England keeper’s house building and sand dune beach setting. For those of a romantic nature you can even enjoy an overnight stay in the keeper’s house.